My wife was asking me yesterday if this was getting less exciting. I told her that there is no way getting to try a brand new beer from around the world could get less exciting, at least for me. Today’s fifth beer comes to us from Italy. 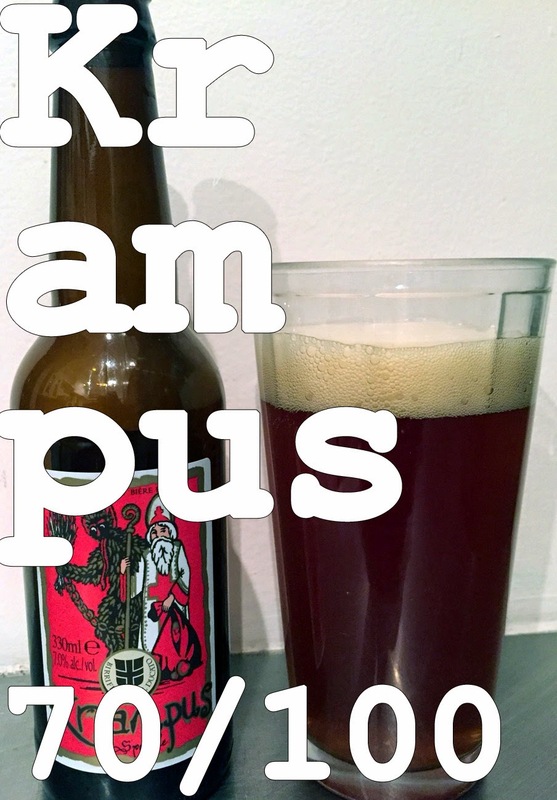 It is a season beer from Birrifico del ducato (Ducato Brewery) and it is called Krampus. Italy is not typically thought of for its beers. As one of the most prolific wine producers in the world it is understandable why. I had the opportunity to visit Italy last summer and found that there are quite a number of craft breweries around the country. I tried all the ones I came across and was rather impressed. I told my wife that I was likely one of the few people who is in Italy and seeks out craft beer. Birrifico Del Ducato is located in a small village called Roncole Verdi which is located in the Parma region of Italy. Parma is famous for its “parma ham” (prosciutto) as well as fizzy wines such as Lambrusco and Malvasia. Roncole Verdi is also the birthplace of composer Giuseppe Verdi from which this brewery draws some inspiration. The brewery is run by Giovanni Campari, brewmaster, and Manuel Piccoli, entrepreneurial mind. They harvest their ingredients as often as possible by visiting the farms and selecting the hops, malts and barleys that they will use in their beers. The produce a number of beers all year round as well as seasonal beers released only at specific times of year. Krampus, the beer I will be trying, is one of those seasonal beers. Krampus is a beast-like creature from the folklore of Alpine countries thought to punish children during the Christmas season who had misbehaved, in contrast with Saint Nicholas, who rewards well-behaved ones with gifts. Krampus is said to capture particularly naughty children in his sack and carry them away to his lair. This beer draws inspiration from Belgian beers. It features 9 different spices and is similar in style to the winter warmer I had on day one. The difference here is that this lighter and produced in the style of the Belgian wheat beers like I explained yesterday. This is why beer is so exciting. You can mix and meld styles based on your brewing technique and the ingredients you include. This particular beer sits at 7% alcohol. Now, let’s get on to the beer! Appearance: Nut brown with a reddish hue and about 1.5” of head that dissipates slowly. Smell: Cranberry is front and center with smells of other spices typically used in mulling. Taste: When I read that this is styled after Belgian beers I thought it was the more common Wheat beer like yesterdays. It is, however, not. It is styled after the Belgian fruit beers similar to Fruili. Cranberry juice is present and is the most front and center flavour. Sour cranberry candies is the best way to describe the taste. This overwhelms any other malts or hops that may be in the beer. Mouth feel: Strong carbonation almost like a soft drink, coarse, medium body. Overall: Not what I was expecting. I do my best to keep these parts of the neutral. So, for a fruit style Belgian beer it is quite good. The sour candy flavour is one that is pleasant and people who like this style of beer would really enjoy this one. My wife, who does, really liked it. Do I like it: I am not a fan of these styles of beer. While I try to keep an open mind, I do not at all like this one. It is my least favourite thus far. I do have to note that my scores do not take this into account. I just do not like it, personally. Thanks for reading along. I hope you are enjoying it. Looking forward to tomorrow’s beer!